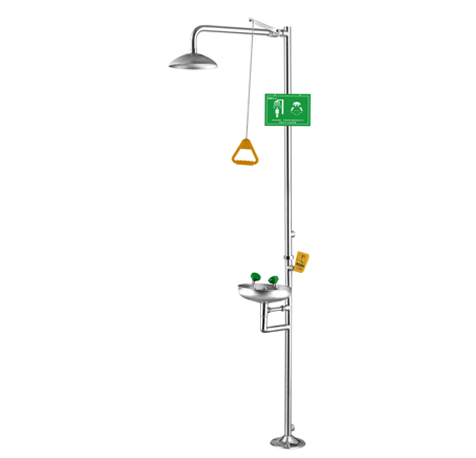 Specializing in the production of emergency shower eye wash, safe eye wash device, wall-mounted eye wash device, composite eye wash device, vertical eye wash device, desktop eye wash device, wall-mounted eye wash device, chemical factory eye wash device, laboratory eye wash device, emergency spray Eye wash, emergency eye wash, safety shower eye wash, 304 stainless steel eye wash, eye wash accessories and other products. Our products are widely used in petrochemical plants, electronics factories, pharmaceutical companies, bio-coating plants, plastics and rubber plants, Paper mill, printing and dyeing factory, spraying production line, plastic factory, printing factory, textile factory, nuclear energy industry, etc. The products have passed the certification of relevant national departments and the certificates are complete. Welcome to call to order (price concessions)! 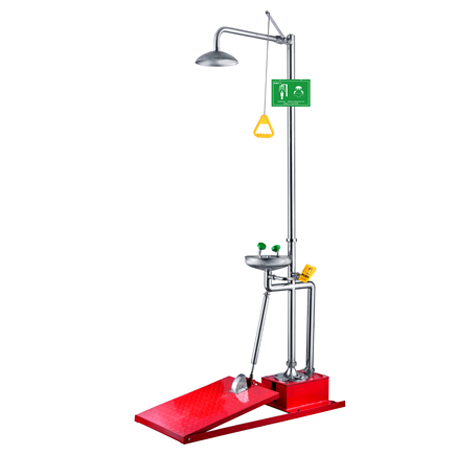 Eyewash is an effective safety protection product that is used when a chemical liquid is sprayed on a person’s body, face, eyes, or a fire that causes the clothing to catch fire. This product is manufactured in accordance with the US ANSI Z358.1.1990 standard. Users should read this manual before using this product. If you would like more information on the use and selection, please contact our after-sales service department. 1. The water flow of the shower device is 120-180 liters/min. 1. Eye wash nozzle: a water spray port for cleaning the eyes and face; the eye wash nozzle is equipped with a double-layer filter to ensure the water quality is clean. 2. Eye-washing nozzle dust cover: dust-proof device for protecting eye-washing nozzles. 3, shower head: a sprinkler for cleaning the whole body. 4. On-off valve: A valve device used to open and close the water flow. 5. Water pipe: A device used to guide the flow of water. 6, the base: fixed eye wash.
1. Contact toxic and harmful places such as organic substances in acid and alkali boxes. 2, use at room temperature; in the cold areas need to pay attention to the pipeline anti-freeze work, cold areas are recommended to use anti-freeze type devices or heating devices. 3. Where burning may occur. 4. The hazardous material splash box has a polluted environment. 1. It is recommended to install in a clean area (which must be on the same floor) that is reachable within 10 seconds from the accident-prone area. The closer it is, the better it must have at least three working positions, and there is no obstacle in the passage for quick use. 2, with obvious warning signs, if necessary, can be equipped with alarm devices and lighting facilities. 3. The water source has normal water pressure and water flow, and should be cleaned or filtered with appropriate filter material. A safety special room should be set up near the control room of the device. The indoor should be equipped with safety protective clothing, neutralization pool, personal washing facilities, eye wash, emergency medicine, etc. 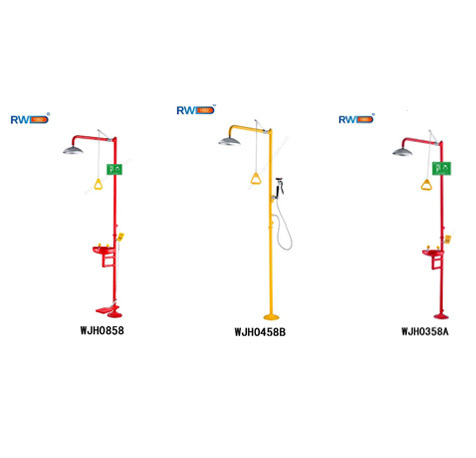 In the vicinity of the main fractionator feed pump, return pump and regeneration tower feed pump, the human body and pool, accident shower and eye wash should be installed. Device tools and pools should be set up in the unit. There should be a safety special room inside the device, which has a neutralization pool, a shower, an eye wash, and a safety protective suit and a first aid medicine box. 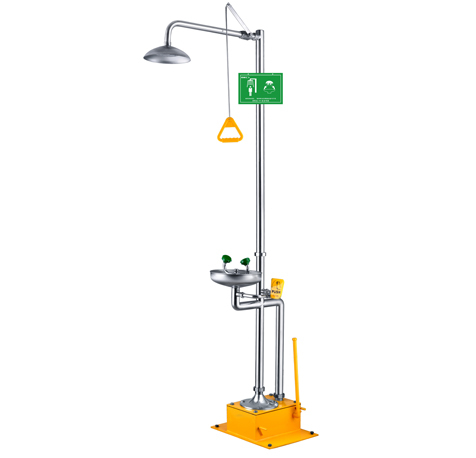 In the working environment with toxic hazards, the necessary sanitary protection facilities such as showers and eye washers should be designed with a service radius of less than 15m. Accident cabinets, first aid kits and personal protective equipment are configured according to the characteristics of the operation and protection requirements. 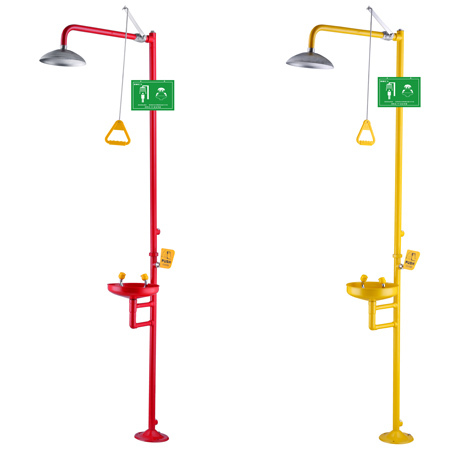 In the work area with chemical burn hazard, safety protection measures such as eye wash and shower should be designed, and an ambulance box should be installed in the installation area. Staff are equipped with the necessary personal protective equipment. Emergency facilities such as water shower facilities and eye wash should be installed in the workplace of highly toxic materials. 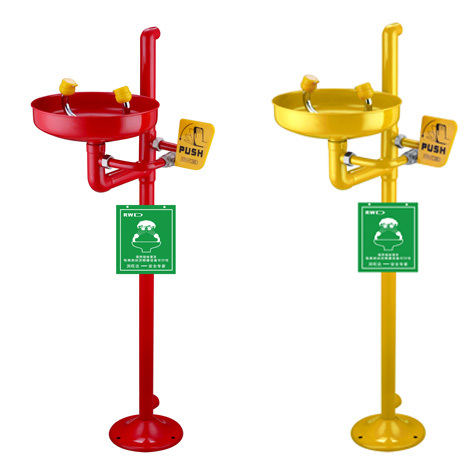 The eye wash device is installed in the hazardous chemical area, and the user can reach the eye wash in a straight line for less than 10 seconds. The scope of the eyewash ambulance: within 15 meters. Eyewash can not be installed over the floor. There is no electrical switch around the eye wash to prevent accidents. The eyewash outlet must be connected to a sewer or a wastewater treatment tank. Anhui Huasheng Technology Holdings Co., Ltd. is a leading one-stop service platform for laboratory planning, design and decoration. It provides laboratory equipment system application solutions, including laboratory equipment, accessories, furniture, fume hoods and so on. Suzhou Century Bank strictly abides by: the quality of products first, the credibility of the first, the customer first. The warranty period of the products sold by the company is one year. The company will repair the products free of charge due to the quality problems caused by the products, materials and processes within one year from the date of sale. After the warranty period of the products sold by the company, it is still responsible for the labor-free repair of the products to protect the interests of customers.